Festival, Festival, what is this ? Well, you have eagle eyes indeed and you have of course spotted the fact we are now the Kop Hill Climb Festival. So, why is this? This year is our Tenth and in that time, let’s just say that an awful lot has changed. What started as a small band of enthusiasts running our cars and bikes up the hill is now put together by a team of over 200 volunteers. We bring to you a super event with hundreds of amazing cars and bikes that welcomes tens of thousands of you every year and has raised over half a million pounds for charity to date. Wow. 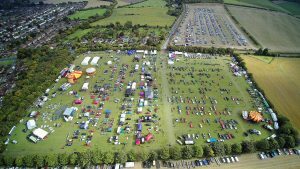 Of course the cars and bikes are the main event, but there’s so much more to Kop Hill – the soapbox Challenge, music on the live stage, the vintage funfair, lots of great food and drinks stalls, the wall of death ….. OK ….. let’s spare you the sales pitch. So, we decided that the word Festival beautifully encapsulates the atmosphere of Kop Hill Climb and all that is great about our “little” event. We very much look forward to welcoming you to our Tenth – The Kop Hill Climb Festival 2018.